Humboldt Box is one of the most distinctive places in Berlin. Generally you would associate Berlin with attractions that are a lot into history, art and a lot to research. But, Humboldt box is one of the best places in Berlin if you are the kinds who are interested in futuristic sciences. 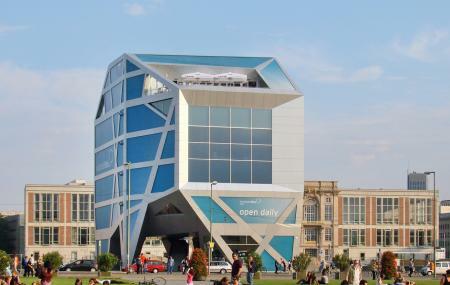 It is a futuristic looking building in a shape of a box. It has a lot of interesting things to offer to you, so make it a point to visit this place to take a break from all the other history related places and streets of the city. Handicapped parking spaces are available in front of the building. How popular is Humboldt Box? People normally also visit The Circus Hostel while planning their trip to Humboldt Box. Brilliant inside to the rebuild and restoration work being undertaken. Really well done!! Staff limited English!! Go get that view before it is too late. Humboldt-box to be dissambled in March 2019. Free entrance, modern building. The café at the last floor has a nice view on Berliner Dom and Pergamon museum. The maintenance and security of the building is really good. A small donation is more than welcome.